Ocean's 7-11 is an apt description of Steven Soderbergh's latest film. It shared a DNA with his Ocean's Trilogy, from the tone, the structure and the concept. All except that in this case, it all felt a bit more hillbilly, i.e. less class, less refined and less witty. The cast's chemistry though good, lacked the electrical excitement and easy repartee that was the highlight of the Ocean series. Nonetheless, this was a fun and easy ride that actually managed to wrangle out some real heart-tugging emotions at the end (boy, John Denver is sure having a moment). One thing for sure, Channing Tatum should stick with Soderbergh because he knows how to bring out the best in Magic Mike. The screenplay is by Rebecca Blunt (hooray for her and Soderbergh) and although it was a competent script that made sense (at least movie-logic) and was filled with a number of witticism, the characters eventually lacked depth and were stock stereotypes. It could very well had been a fan-fiction of Ocean's Eleven for the redneck crowd polished up for Hollywood consumption by Soderbergh and co. It would be interesting to see if she can churn out something more original in the future. Soderbergh's direction was typical of his style. Close-ups, side-swipes, and jaunty and catchy music to underscore the action. Reliable and effective and worked well for a heist film. So no complaints there, but neither will it be applauded. Tatum stood out as the lead of this ensemble of known but not-super A-list stars. Although his emotional range still needs work, he has an easy bromantic-relationship with onscreen brother Adam Driver and also a relatable and believable father-daughter relationship with his young co-star. The latter of which was important when the heartstrings gets tugged. Driver obviously can act, so hopefully his next outing as Kylo Ren will be better. Daniel Craig should do more comedy, but not in an American accent. Or at least not in a southern accent. But other than that, it was quite hilarious to see Mr Bond doing the funny. Elvis' grand-daughter Riley Keough has potential, but only time will time if she has the chops to breakout from the shackles of her heritage. Brian Gleeson and Jack Quaid played the roles of the Ocean's Malloy brothers (Casey Affleck and Scott Caan). Does that mean that one day Gleeson or Quaid may eventually end up with a Best Actor Oscar? Katie Holmes and Katherine Waterston were more of gloried cameos. As were the annoying Seth MacFarlene and underused Sebastian Stan. Hilary Swank seemed to be there just in case a potential sequel gets greenlit. What a waste. Music was by David Holmes who did the Ocean's trilogy so expect similar but with a bit of a southern twang; cinematography was by Soderbergh under his usual pseudonym of Peter Andrews (as like his previous films). 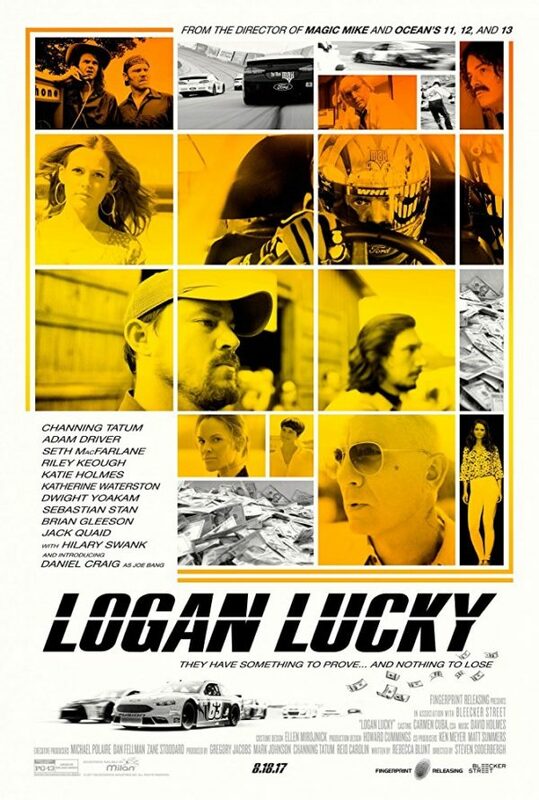 Logan Lucky was a fun heist comedy with a bit of heart, that although not highly original, was sufficiently entertaining and competently acted.